Apparently no one, including its drafters, is entirely happy with the revision of Vietnam’s Land Law that’s been circulated for comment by the Ministry of Natural Resources and Environment. Experts, indigenous and foreign, have detailed problems they see with the current law and what needs to be done to fix it. The National Assembly argued about the draft for two days in October and may vote on a revised text in May. Another scenario has the arguments continuing until the legislature’s next session late this year. Vietnam’s newspapers have been full of reports and carefully calibrated comment, while in parallel a free-wheeling discussion animates the less well-supervised blogosphere. With all that as prologue, February 1 began an official two month period of public comment. Two issues generate impassioned argument: the scope of a farmer’s rights to exploit a piece of land and how and when the state may require farmers to yield that land for other uses. These were at the heart of the Tien Lang and Van Giang confrontations between police and farmers last year and — as nearly any Vietnamese can attest from direct knowledge — of countless more obscure disputes, arguments that clog the local courts and have fueled farmers’ disenchantment with the regime in every part of the country. There’s rarely a respite. In December, holdouts against expropriation barricaded a major highway east of Hanoi. As January ended, farmers on Hanoi’s western fringe fought an hour-long battle with police and bullies arriving to clear the way for bulldozers. In Vietnam ideology still matters when decisions are made within its ruling Communist Party (VCP). Its constitution proclaims Vietnam a “socialist law-based state.” Because the nation is ostensibly “socialist,” land is “owned by the people and managed by the State on their behalf.” However, when Vietnam abandoned collective farms and other failed attempts to run the economy along classic socialist principles circa 1990, the right to use pieces of farmland was distributed to family units. Subsequent reforms permitted farmers to swap or sell their land use rights certificates. Over the years, Vietnam’s effort to build “socialist legality” has resulted in a thicket of laws intended to anticipate and solve every question arising in national life, including the real estate sector. The revision of the Land Law that’s being debated is 158 pages long, paragraph after prescriptive paragraph. Also settled, it appears, is that the regime will remain intimately engaged in deciding land use plans, setting land prices and reviewing private decisions to lease, give away, mortgage, bequeath or sell land use rights. Only the State can decide if rice land can be used to grow other crops or farmland can be used for other purposes. With these matters effectively off the table, attention has focused more and more on the vexing issue of when, how and for how much the State will manage the process of “recovering” land assigned to farmers so that it may be used for other purposes. Reformers maintain that Vietnam would gain in efficiency if the State’s right to take back land were limited to situations where national security or the public interest is clearly at stake. They argue that leaving other land conversions to “the market,” i.e., to negotiations between would-be developers and farmers whose land the developers want, is far more likely to establish a price that persuades farmers to relinquish their land use rights. Under current rules, land clearing for development is a tortuous process, and an important reason that Infrastructure development lags throughout Vietnam. Emerging markets guru-of-the-moment Ruchir Sharma has branded the allegedly high cost of land clearance and Hanoi’s consequent failure to build an efficient system of roads and ports as fatal impediments to foreign investment in Vietnam’s manufacturing sector. Real estate developers insist that the threat of state intervention is necessary to prevent a handful of holdouts from tying up a project indefinitely. From that perspective, it’s understandable that some state planners are loath to give up their right, when persuasion fails, to compel farmers to yield their land. Proposals to leave price-setting to the market when farmland is taken for commercial development were rejected in 1993 and 2003 on ideological grounds. Then as in the current draft revision, the ‘solution’ chosen was better oversight and better Party discipline. That orthodoxy is also embodied in the current draft revision of the Land Law, though popular discontent with the manner in which forced takings are carried out has grown exponentially since the Land Law’s last revision. This discontent is largely a consequence of the online information revolution. With access to reports of protests from all over Vietnam, farmers have learned to push back against abuse of power. Allegations of corruption are rife. Over 700,000 official complaints have been recorded in the past three years, mostly related to compensation. Local officials are instructed to set compensation at levels “close to market prices” for agricultural land but in practice the offers fall far short of reasonable compensation. Then, when land clearance falls far behind schedule, the same officials are forced to resort to heavy-handed tactics. It’s possible to see the officials as both bad guys and tragic pawns. Development companies very often persuade local governments to take over the responsibility for land clearance. Applying present law, officials can offer farmers only a few dollars per square meter for land that, converted to housing tracts or factory sites, will sell for as much as 50 or 100 times more. Predictably, not all farmers succumb to demands that they “cooperate,” and in the end, holdouts must be forcibly evicted. Fully aware that playing this middleman role compromises their image, officials rarely pass up the chance to reap windfall gains through kickbacks from the developers. Not all are corrupt, to be sure, but the current system is undoubtedly corrupted. In the wake of the January 2012 Tien Lang incident, Vietnamese public opinion became certain of that. There is virtual consensus that farmers have not shared the benefits of the nation’s economic growth and in far too many cases have been its victims, deprived of their land for a fraction of its worth. The regime, though loath to limit its power to reclassify land or require its surrender, is at least striving to make the land system more resistant to collusion between officials and speculators. Experiments with a system of voluntary recourse to arbitration in Ho Chi Minh City have reportedly been successful. That’s an innovation that may find its way into the revised Land Law. 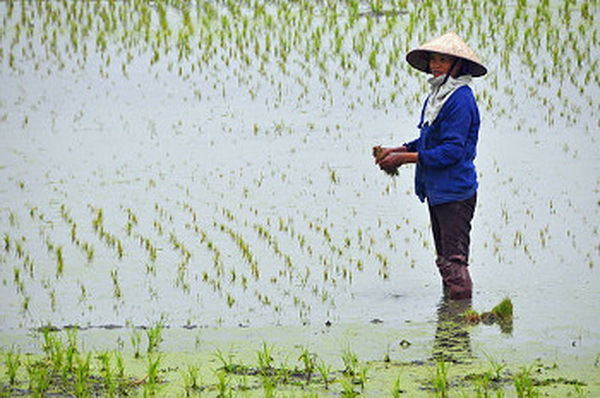 It’s unlikely that changes of these modest proportions will satisfy Vietnam’s farmers. That’s a huge problem for the regime. Hanoi has long taken the loyalty and support of the rural population for granted. However, farmers no longer see land issues solely as a matter of greedy village or district officials colluding with developers. They and the rest of Vietnam’s “public opinion” tend to regard the problem of fair compensation also as a systemic cancer that top officials cannot or will not treat. Simply put, farmers are losing faith in the Party’s leadership. In Party councils, reformers continue to press for more robust reforms. It’s said that they argue that failure to deliver change is not only economically incorrect but also erodes belief in the Party’s leadership. Their non-Party allies keep up a fusillade of pro-reform argument in the media. Will this lead to a change in direction? Perhaps, but first representatives of Vietnam’s provincial governments, industrial ministries and the construction and property development sectors must be convinced. So must Party theoreticians. All these groups are all well represented in the Central Committee, and all have a stake in the status quo.